Alison Yip currently lives and works in Amsterdam. She works with painting, wall treatments, and sculpture. In ‘Enough Rumours to Swing A Cat’ visual artist Alison Yip rewrites small town stories into absurd anecdotes and wallpaintings. She spent one month introducing local Frysian histories to Kunsthuis SYB by talking to neighbours, drawing up patterns and transscribing tales. Gossip is known for growing in its notoriety by losing truthful detail as it gets passed along. In the process, vacuums give way to all sorts of phantasms. This lifeline of rumours seemed to inspire the way Yip dealt with the littlest things she found in and around the house, turning them into what she called God Syb. I, on my turn, went to the residency presentation to tell you what I saw, or at least to tell you what I made of it. The narrator of Alison’s collected stories is a 50 kilogram-weighing polyester ice-cream from across the street. Alisons boyfriend had seen it chilling on the opposite sidewalk, as he was leaning against the windowsill. It is a colourful cone, the tasty kind with a little grid in its cookie and three scoops on top. Seeing it there, he persuaded the owner to exhibit it the morning of the presentation, using a photoshopped sketch of an ice-cream starring on a red-curtained theatre stage. A red sock, a bundle of half-eaten grapes, and a few other objects found around the house were glued to the enormous never-melting ice-cream with metallic tape. And on top of that, Alison lending her voice to it, the town’s ice cream rose to the allure of a performer. It exclaimed the abstract stories that Alison had written, based on anecdotes of passers-by. Locals, she told me, had happily spilled gossip over a cup of tea. The icecream effectively melted them back into new shapes. As if it were a spectator at its feet, a blue crafted piece of felt lay before the enormous cone, in the middle of the little room. It was hard not to touch it, it looking so wooly and drenched in different blues and purples. It was the work of Alisons acquaintance Lotte that lay there, absorbing the stories as they went around the house. Alison had opened the door widely, inviting anyone who wished to stay with her at SYB. Lotte talks to me about time, making cyanotypes, light sensitivity and crafting felt treating its pluche beads like pixels. The blues and whites nicely bled into each other like befriended neighbours. Climbing up to the ﬁrst ﬂoor of the house, I ﬁnd in the living room a painted frieze. Two stencilled ﬁgures hide their badmouths behind coloured fans. 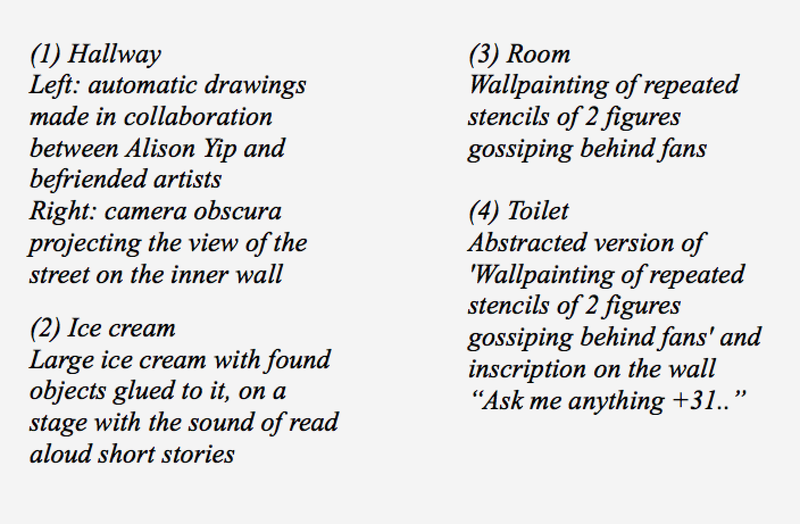 The painting of gossip endlessly repeating itself, I write down “telephone”. I decide not to get into the possibility of ﬁnding myself make long explanations on a game I used to play as a scout, a game that is also known as “Chinese whispers”, hence the fans. Six minutes later Alison —with a look that insinuates she has no idea if I have a clue what she was talking about— tells me the looping wallpainting reminded her of this game called “telephone”. It is exactly in her gentle, caring precision, that I later recognised the usage of patterns in her work, the decorative history of interior design, the care with which she chronologically organised and reproduced the woodcut notations of hearts and initials she found in the forest on the wall, and the naive crackling of the voiceover every time a a plosive consonant comes up. As I push my pen against my teeth trying to make sure I am not forgetting ﬁction-friendly speciﬁcities, she says, “Remember, you can ask me anything”, giving a small nod to the handwritten message on the wall of the toilet, mysteriously and very local-bar-toilettradition-like, subscripted with a phone number. In what at ﬁrst sight may have seemed a slightly blurry arrangement, I understood through anecdotes and badminton that Kunsthuis SYB had done its task again, being a place for time, light sensitivity, Frysian candy and homely friendly feelings mixed with odd small-town story mashing.